On March 13th, the voters of Tempe passed a local ordinance to ban dark money with 91% support. However, Arizona state politicians are trying to nulify the transparency ordinance by passing House Bill 2153. If passed, the bill would would trample local power by blocking cities and counties from passing transparency legislation in the future. A coalition comprised of Arizona Advocacy Network, Represent Arizona, and Local First AZ have been focusing their efforts on passing this local ordinance in Tempe, AZ. This binding legislation strengthens disclosure requirements and set standards for transparency in local elections. The bill is currently awaiting Senate approval, and if passed, it would silence the Arizona voters and void the ordinance completely. But we’re not backing down without a fight. 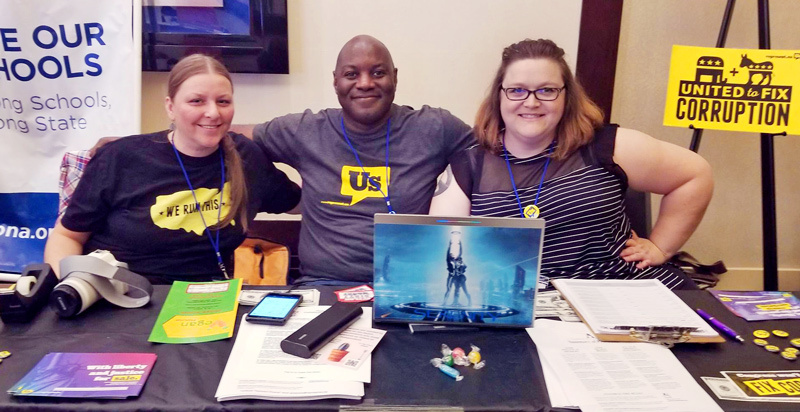 Represent.Us volunteers in Arizona are leading a public education campaign and putting a giant spotlight on the legislature’s actions. Chicago has been coined the corruption capital of the US, and it’s not for nothing: four of the last seven governors have been sent to prison on corruption charges. Residents are fed up and have finally taken matters into their own hands. On February 7th, after nine months of grassroots work, Represent West Suburban Cook County passed the largest (by population) anti-corruption resolution win to date in Cook County, IL. Don’t let the name ‘Cook County’ fool you – the county encompasses a population of over 5 million people in the greater Chicago area. This isn’t the first Illinois resolution victory either, Represent Chicago and Represent Rockford have led resolution wins in five other locales across the state – and they’re not done yet. 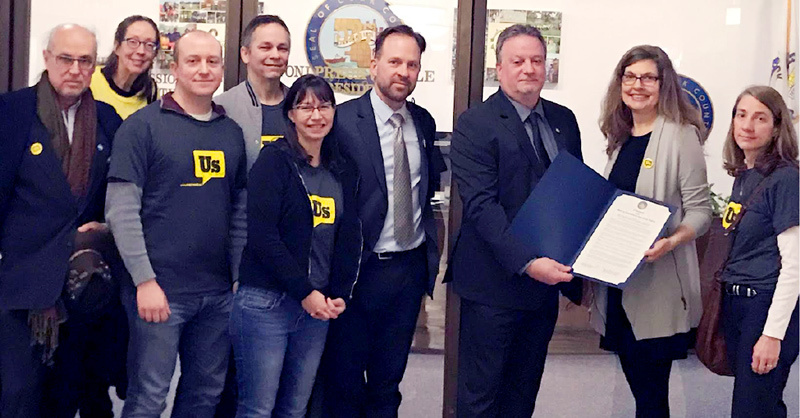 Represent.Us members will continue to throughout the state to pass anti-corruption measures and kicking off their newest chapter in DuPage, IL. 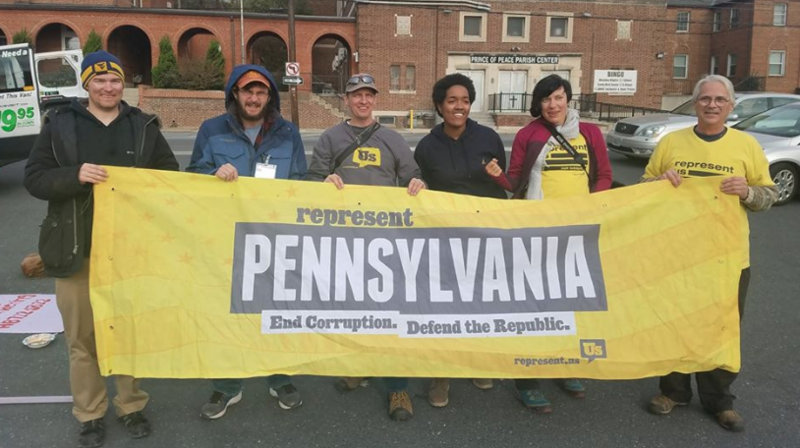 Represent Pennsylvania has come up with a strategy that has led them to five anti-corruption resolution victories in the last two months. On February 14th, Kingston Township and Foster Township passed the state’s 5th general anti-corruption resolution of the year. This was due to Represent PA members writing letters to city councils across the state, urging them to adopt American Anti-Corruption resolutions. Members also partnered with the local group March on Harrisburg earlier this year, where they took part in a 36-mile trek to rally at the Pennsylvania capitol. The goal of the march was to urge Representative Metcalfe to stop blocking the vote for a lobbyist gift-ban. The coalition is working towards passing a number of other local resolutions and building up their new statewide chapter. A new hope is growing in the heart of downtown Bridgeport, CT, with Represent.Us members taking a stand against the city’s long history of corruption. A group of young activists called Bridgeport Generation Now, have taken action by launching the Represent.Us group, Bridgeport United Against Corruption. The Represent.Us group has brought their first anti-corruption resolution to the City Council, and looks to fight for its passage during its council vote on April 2nd. Volunteers are stepping up all over the country and we’re seeing real progress in the fight to fix America’s broken political system. Since the start of 2018, eight new chapters have joined our grassroots movement and they’re already working on local campaigns to pass anti-corruption resolutions in their area. Sign up now to be a volunteer and join the grassroots effort to fight corruption in cities and states across the country.